So now, not only did I have my triumvirate of doom, the same killer bench, and a smattering of promising prospects from my 2015 championship team, but also one of the best scorers in NBA history. I went into the season overconfident to say the least. We started off at a blazing pace, beginning with a record of 24-5, which blew every other team out of the water. Then, I made one of the biggest mistakes in NBA 2K14 association mode history. The only low point to this season thus far was that my Finals MVP, Goran Dragic, seemed to be entering a period of steep decline. Despite being a snappy 29 years old and coming off a playoff performance that rivaled that of greats like Magic Johnson and Isaiah Thomas, Dragic started the season in a tailspin. Maybe it was the addition of Kobe that did it, but I really don't see how another great passing option could have hurt him quite that much. Anyways, through those first 29 games, Dragic averaged a piddling 11 points and 7 assists, a far cry from his numbers the year before. To make it worse, his shooting percentages had fallen off the cliffs of Mount Doom, with his field goal percentage at 40% and his three point shot languishing in the low 30s. For perspective, the year before he had been apart of that coveted 50/40/90 club (really it was more like the mythical 50/45/90 club). So, despite Dragic's massive contribution to my Finals victory, I was contemplating making a trade. The disaster began when I played the Washington Wizards. Dragic played horribly, bricking shot after shot, usually wide open. I couldn't understand how a player could decline so rapidly. Simultaneously, a rookie on the other team torched Kobe and Klay Thompson, leading to an ugly loss. I made a decision right then and there: Dragic was gone. Immediately after I lost the game, I went to see what trades were available. The one that stuck out to me was an offer from the Wizards, the team that had just shamed be. They were offering the rookie who single-handedly dismantled my team in exchange for Dragic and a first round pick. 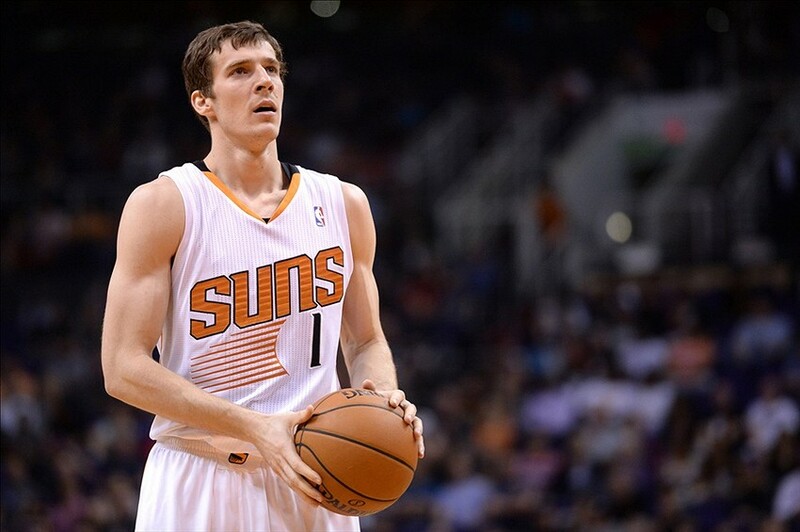 At first I wondered why they would want the sharply declining Dragic. Then I concluded that the computer AI must have placed some value in Dragic's Finals MVP award, assuming that his poor numbers were just a fluke. I jumped on the chance to take the rookie, trading away the point guard that had, in part, brought the 2015 championship to my Los Angeles Lakers (for the record, Dragic did no better on the Wizards for the rest of the season...maybe I broke his spirit). While I had gotten rid of one problem in Dragic, I'd opened an entirely new can of worms by trading my starting point guard for a shooting guard. Not only that, but my team's chemistry plummeted (no surprise, considering Dragic's role on that team -- though I later learned that 2K14's chemistry system is bugged to all hell so I turned it off). As I juggled the rotation, trying to figure out a way to find time for the rookie, Kobe, Klay Thompson, and Harrison Barnes, my team's record suffered. Eventually I made the rook a 6th man, starting one of the point guards that used to back up Dragic. By the time I did that, however, I'd already gone on several major losing streaks. At the end of the year, my record was 47-34. If you do the math, that means I went 23-29 during the latter part of the season. Ouch. That was still enough to give me the second seed, but it was fool's gold. There was no way that a 23-29 team was going to get anywhere in the playoffs. I simulated a couple games against my seventh seeded foe and could instantly sense that I wasn't making a miracle run this year. I conceded gracefully, my opponent beating me in six games. Once the champion was crowned, Kobe retired, leaving 3 years and 33 million dollars on the table to get away from my train wreck of a team. My coach retired as well. I wasn't surprised, especially in regard to Kobe. Going to a team with repeat expectations, only to crash and burn during the season (thanks to me), and knocked out by a seventh seeded team to top it all off. A rough way for a hall of famer like him to end his career, to be sure (sorry Kobe). So there you have it. The story of how I took a team of underdogs (in every sense of the word), turned them into champions, got on track to repeat i­­n 2016, and ruined it all with a bad trade. Funnily enough, my disaster of a season actually had a few silver linings. For one, Kobe's retirement (I'm sure he's hired virtual assassin's to take me out) opened up a huge amount of cap space. I threw caution to the wind and used it to offer the maximum contract possible to Damian Lillard, a restricted free agent (which means that his team could match any offer I made). They decided not to (because I had offered him so much money), and, just like that, I'd turned the loss of Kobe into acquiring probably the best (or second best) point guard in the league. At the cost of the 2016 championship, I'd turned Goran Dragic and Kobe Bryant into Damian Lillard and the freakish rookie from the Wizards. My frazzled team, which had retained its 2015 championship core of Griffin, Thompson, and Barnes, was now set to make another run with the addition of two young, talented, and explosive pieces. Expectations are high. The 2017 championship is ours for the taking; there's really no excuse given how stacked my roster is. All I have to do this time is to not screw it all up with a disastrous (at least in the short run) trade. Wish me luck! Thanks. If y'all want an update, here's what went down: I felt bad for Dragic and so traded a few pg prospects for him. Now I've got a pg rotation of Lillard/Dragic which isn't too shabby, lol. Dragic still isn't as good as he used to be but he seems to have gotten out of that rut he caught himself in when I traded him away. The problem is now Blake Griffin seems to be on the decline. I really don't get why 2K14 does this. The past few seasons he's been unstoppable; now at the ripe old age of 27 he's getting blocked by 67 rated centers and power forwards every game. Must have something to do with the way the game is coded. Anyways, even with Blake playing like crap my team is on the upswing again (I think they're 25-14 last I checked, not great but better than most).